You've probably seen this already, but it's The Trilogy Meter by a cat named Dan Meth. I think it's spot-on, especially The Godfather one. That is a surprising accurate list. I would only argue the Indiana Jones and the Last Crusade was better than The Temple of Doom. I agree with everything else. Nice find. I don't want to be the one guy that says it, but a number of those aren't trilogies... although I understand the argument that most of them that aren't trilogies became non-trilogies many years after the original trilogy. But the last Indiana Jones is WAY better than Temple of Doom. Also, the true Star Trek trilogy is 2, 3, and 4, not 1, 2, and 3 (2, 3, and 4 have a consistent storyline leading from one to the next to the next). I'd rank Alien 3 much higher. Good post though. Third Godfather worse than the third Superman? Not on your life. 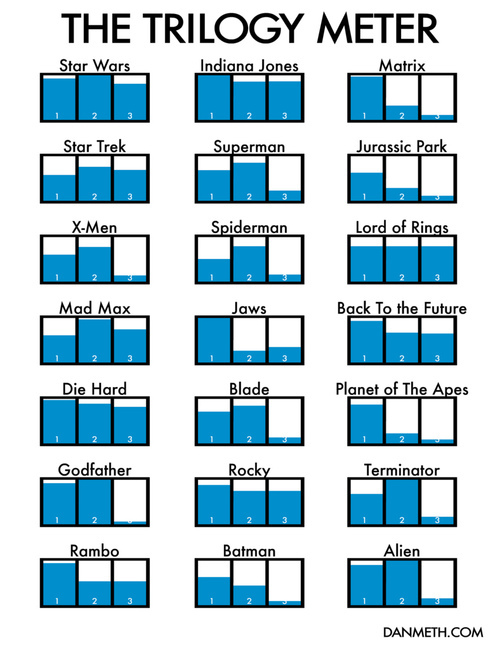 I'd say Temple of Doom a bit lower, Matrix 2 a chunk higher, Superman 3 all the way to the bottom, X-Men 3 slightly higher, all three LotR movies pretty much at the top, Die Hard 3 much lower, Godfather 1 at the top, Godfather 3 higher (but not very high), Terminator 3 a little higher, and Alien 3 a fair bit higher. I gotta say Rambo 2 and 3 should be but slivers of blue. Yeah I would give full marks to the Indy Trilogy, I also thought that Terminator 3 was better than his ranking. Jaws 2 was miles better than 3, 3 was a joke and should be canned forever and forgotten about. Which Star Wars Trilogy is he referring too? I think you have to consider Star Wars a 6 pack. No Revenge of the Nerds in there.